You can rest assured that my Townhome is a very comfortable and spacious 3BR/2BA with large open area living space. Newly Installed HVAC system providing Cool AC throughout unit and comfy non-dry heat during winter. (1) BR 1st Flr with ensuite, 2nd Flr BR/ensuite and 3rd BR and Loft, providing for sleeping 10 comfortably in beds, with a maximum of (8) adults. Unit consists of (3) Queen beds including an Ethan Allen pull out that has an additional mattress cover, and (2) sets of bunk beds that sleep (3) each. My townhouse is a short (6) minute walk to the slopes, there's a picture showing the entrance to the slopes off of Gardner Rd. Its a short (5) minute walk to the pool and tennis courts, It's very quiet and peaceful year round and surrounded by woods. Newly Installed Split Air Conditioning and Heating System provides comfort on the hot days and less dry heating during the cold winter. Spacious living room and dining room with bar overlooking the living room area. Fire place log burning stove which keeps the place nice and warm on those cold nights, fully equipped kitchen, Living Room has HD cable w/surround & DVD/Blue Ray, Hi speed Internet & Wi/Fi, HD TV in Master Suite and 2nd BR, Laundry room, nice roomy deck for cook out or sun lounging, 2nd floor loft is a great area for kids to play while adults entertain on 1st floor. So come and enjoy the slopes at hidden valley or great fall views and a round of golf! There is plenty of parking in front lot of townhouse and a shuttle available to take you to the ski resort at bottom of slopes. Unit has a washer & dryer and two sets of sheets & pillowcases, plenty of bath towels, hand towels, and kitchen towels provided. Hidden Valley is a Four Seasons Resort located in the scenic Laurel Highlands located of SW Pennsylvania and is easily accessible from the Pennsylvania Turnpike, located on Pennsylvania Route 31. Within the resort there are 25 ski slopes and trails, an 18 hole championship golf course, three heated swimming pools, 30 miles of hiking and biking trails, a fitness center, turbo tubing, 12 tennis courts, sleigh rides, hay rides, plenty of Fun for family and friends. This is a Great location in Hidden Valley, a wonderful destination year round because it is within walking distance of The Tennis Club and The Golf Club and the Highlands Swimming Pools. SKIING is a good mix of beginner, intermediate and advanced terrain plus a great kids ski school program make it easy to see why Hidden Valley is one of the Mid-Atlantic's most popular family ski resorts and close to Seven Springs where you ski pass is honored should you decide to try a day of skiing there. The superior snow making is terrific and there are short lift lines. • Comprehensive Kids Program - Organized outdoor winter activities and learn-to-ski programs for children ages 3 and up. • Great X-Country - 30 miles of cross country trails traverse both the resort and surrounding park lands. OUTDOOR ACTIVITIES ON THE MOUNTAIN: Fishing, mountain biking, hiking, playground equipment, basketball and other games such as lawn darts, corn hole, balls/games available for borrow/use at Highlands Pool. There are many activities and things to do in the Laurel Highlands; Idlewild and Soak Zone, Caddy Shak Family Fun Park, Living Treasures Wild Animal Park, Buffer Creek Sporting Clays, Forbes State Forest, Horseback riding at Horizon View Farms, 150-miles of biking and hiking trails on the Great Allegheny Passage, Kooser State Park, Cave exploring at Laurel Caverns Geological Park, Laurel Hill State Park, Mountain Playhouse and Green Gables, Quecreek Mine Rescue, Fort Ligonier, Fort Necessity, Wineries – Glades Pike Winery, Stone Villa Wine Cellars, and Greendance Winery. On September 11, 2001, the 40 passengers and crew of Flight 93 were killed when their hijacked plane was crashed into a field in rural Shanksville, Pa. The courageous crew and passengers thwarted the hijackers’ plan to attack the nation’s capital, likely saving countless lives. Our nation owes a debt of gratitude to these brave individuals, the memorial is a place to learn about and honor the extraordinary actions of those individuals. Just a short drive from Hidden Valley is Frank Lloyd Wright's architectural landmark, Fallingwater. Built between 1936 and 1939 by famed architect Frank Lloyd Wright, Fallingwater is an architectural marvel. Perfectly positioned over a beautiful 30-foot waterfall, this National Historic Landmark is a must-see for any visitor to the Laurel Highlands. Reservations are essential before visiting Fallingwater. Tickets may be purchased online or tickets and reservations are available by calling Visitor Services. The Great Allegheny Passage (GAP), a 150-mile system of hiking and biking trails that connects Pittsburgh to Cumberland, Maryland, is now easily accessible from Hidden Valley 4 Season Resort. A full day of family fun and adventure will begin at the trail head. You will ride along the trail and see stunning landscapes, waterfalls, wildlife, and rafters, quite the trip! Once you arrive at your final destination visit some of the businesses or ice cream shop for a nice end of ride treat before returning to resort. Ohiopyle State Park encompasses about 20K + acres of rugged natural beauty and serves as the gateway to the Laurel Mountains. The focal point of the area is the more than 14 miles of the Youghiogheny River Gorge that passes through the heart of the park. The 'Yough' provides some of the best whitewater boating in the Eastern U. S. as well as spectacular scenery. Surrounding Ohiopyle Falls is the Falls Day Use Area, the central point for the casual visitor. Ohiopyle Trading Post will structure a whitewater rafting trip on the Youghiogheny River that suits you and your family’s tastes. Beginner Ohiopyle rafting trips and family floats are on the Middle Yough, and can be guide-escorted or self-guided. Intermediate rafting trips are on the Lower Yough, and can be fully-guided, guide-assisted or self-guided. Advanced trips on Class V Rapids are on the Upper Yough and must be fully-guided. Voted Best Kids Park in the World by Amusement Today, Idlewild and SoakZone provide the finest in amusement and water park fun for the whole family. Ride and slide all day or relax and catch a show! High atop a bluff overlooking the Youghiogheny River Gorge and just a short drive from Fallingwater, stands another Frank Lloyd Wright masterpiece, Kentuck Knob. In addition to the house, the grounds of Kentuck Knob feature over 40 pieces of sculpture, added by current owners Lord and Lady Peter Palumbo of London, England. The sculptures can be seen on a self-guided walking tour or with a guide to learn more about their origins and artists. Reservations for guided house tours are recommended. Nine for nine... In July 2002, nine miners were rescued from 240 feet beneath the earth in a never-before attempted effort. Visitors to the site will see the actual rescue capsule and broken drill bit and hear the story of the miraculous events that took place in order to bring about the 'Miracle at Dormel Farms.' The Monument for Life, a seven-foot bronze miner statue, was erected near the site to honor the dedicated team of rescue workers, the relentless determination of the nine miners and miners from all over the world. The Laurel Highlands’ impressive French & Indian War sites depict the war that was a clash of British, French and American Indian cultures which ended with the removal of French Power from North America and set the stage for the American Revolution. Both Fort Necessity and Fort Ligonier offer extraordinary forts and museums with a major emphasis on George Washington whose military career began here in 1754. I'm a Pittsburgh-er that moved to Ft Myers Florida Beach Florida, I once owned this property way back when while I lived in Pittsburgh and have just recently bought it back because I loved it so much! My Family has been coming to HV Resort for over 25 years because its a "family friendly" resort and the kids or beginners can learn to ski easily. Its beautiful year round and my location is very secluded and quiet. I also offer (5) other vacation rentals your can view and plan your next summer vacation in beautiful Fort Myers Beach! There are two outdoor pools, one is a short walk, pools are open Memorial day through Labor day weather permitting and must have the pass provided at my unit. Hidden Valley Resort Lodge (which is a separate entity) is about a mile at bottom of hill, slopes are six minute walk from my townhome and (1) swimming pool is a five minute walk and (2nd) pool is five minute drive. Stayed for President's day weekend with out 3 grown children and their spouses. Loved the place. Plenty of space for all of the seven of us and we had a great time. The kitchen has plenty of utensils for any cooking. The rooms were nice. The only downside for us old people was the distance to the slopes. It is a bit of a walk and coordinated getting dropped off at the top of the hill. But the house more than made up for this inconvenience. We would definitely consider staying here again in the future. Dan’s property was wonderful for our family’s ski weekend. We were 3 kids and 3 adults. We were very comfortable in the condo. Everything was very clean and there were plenty of instructions around the house on how to turn on the heaters, tv etc. Dan was kind and let us check in early and check out later to accomdate our schedule. Technically you can walk to the slopes but with three little kids, we opted to drive all the stuff. Absolutely would rent again. Cozy, great location, super floor plan for 2 families. We rented with several kids in 2 families. Everyone had their own spot. Well equipped for a eat in ski weekend. We had a nice weekend at Dan's house at Hidden Valley. Dan was very responsive and we came up a day early because he let me know the property was available. The house had a variety of pots/pans/utensils/etc. for cooking and appliances were in great shape. The bathrooms and showers had great water pressure. We had a great weekend in this property. 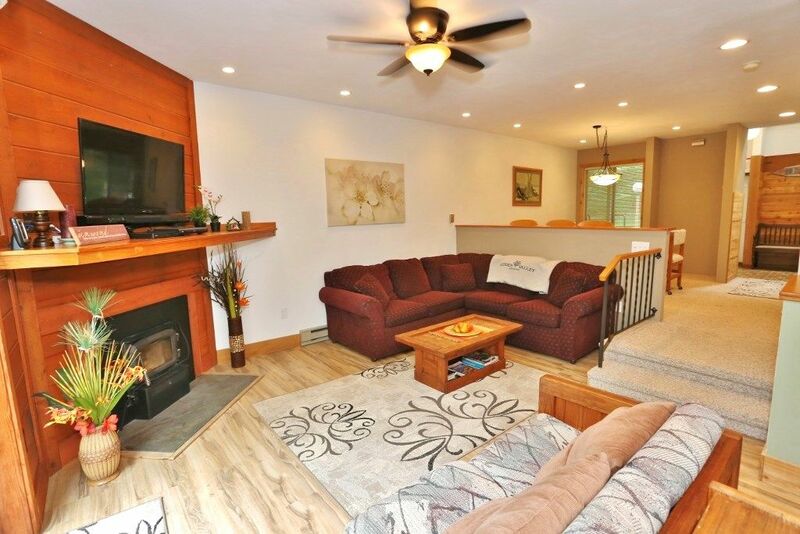 The house is beautiful, well equipped, comfortable, spacious and super convenient to the slopes. It was extremely easy dealing with the property manager and I really appreciated the quick responses. We will definitely come back again! Comfy home with great space for gathering around kitchen/family and dining room. Very clean with well functioning appliances and WiFi. 2 large bedrooms provided queen size comfortable beds and third bedroom had with bunks where 4 tweens/teens had their own space. Also had 2 couches that pulled into beds which we didn’t use so cannot comment on those. We enjoyed the view of woods in the back (family of deer meandered past the first morning) and cooked great meals! Be sure to bring paper towels and toilet paper as it was a dark and windy drive back to town when we ran out! The 2 pools noted were both summer only pools. Our walk to the slopes was, as noted, a 5 min walk but was across 2 roads and around the corner. It was easier to drive skis to slope entrance ahead of time or just drive to base lodge. Home could easily sleep 12 but of note there is a up-charge for each child or adult over six people as you compare prices. We had a great time at this condo and these are just extra pieces of info for those choosing this location. Thanks for the review! As to the upcharge the base rate is for six guests including children, when making the reservation the quote clearly details this and an additional charge for more people is a practical way to provide affordability for groups six or under and as well charge accordingly for a large group such as two family's would likely have, the more guests the more wear and tear. After booking I do provide a weekend shuttle schedule that stops at Gebhart for the commute to the lodge if walking is not what you want to do, or simply parking at the lodge, The only indoor pool is at the resort lodge at an additional charge. PLEASE NOTE: The Base rate pays for (6) Guests, additional guests over (6) total guests requires an additional payment of $20/Person/Night. The maximum amount of guests cannot exceed a total of ten (10) maximum number of adults cannot exceed eight (8). Violation of this rule without written exception will be reason for eviction. The premises are monitored for number of people staying at the unit. Cancellation Policy: If Guest wishes to cancel his/her reservation, the following will apply and be refunded as follows: If Cancelled 30 days prior to the Check-in Date, 100% less $75.00 admin fee. 30 Days or LESS before check-in, Renters will forfeit the total rental, Damage Deposit and Cleaning Fee will be refunded within 10 days of cancellation. Renter may mitigate this loss by purchasing optional Travel Insurance from Homeaway.